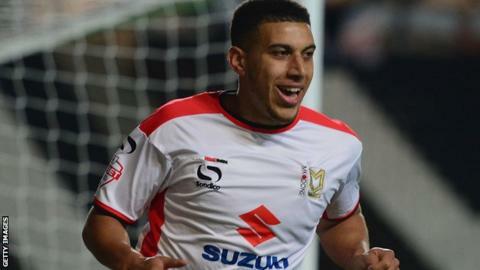 Bolton's wait for their first win of the season continued as substitute Daniel Powell gave MK Dons victory. Wanderers forward Zach Clough's well-struck half-volley was pushed wide in the best chance of the first half. After Dorian Dervite and Gary Madine wasted openings for the visitors, Powell slotted home after an excellent ball by Samir Carruthers. Neil Lennon's side pressed but Clough and former England striker Emile Heskey both had efforts well saved. Bolton have not scored for six games in a row - the last time they did that was 1898. Bolton have not won for nine games in a run that stretches from last season, and remain the only side yet to score in the Championship this season. The Dons, who were promoted from League One last season, have won two of their opening three matches in their first season in the second tier. Having failed to score in their opening three games, Bolton started brightly and full-back Dean Moxey, Dervite and Madine all went close. The hosts improved after half-time and, after Ben Amos saved well from Carruthers's curling effort, midfielder Powell's goal secured the win. "We started okay and we didn't concede many chances but territorially they had a lot of the play with set pieces and corners and they got into our box a lot. "I told them we've earned the right to be here, they've earned the right to come up against some wonderfully gifted players and they've earned the right to show everyone how talented they are. "It's been the story of our season so far - we're playing well and I feel that's a game that got away from us because we were in control for long periods and we've missed big chances. "It's frustrating and disappointing but it's encouraging because to a degree we're playing really well but we need someone who putts, to use a golf analogy. "We look a decent side but we're just lacking that composure in front of goal whether it be the finish or whether it's the final pass and that's the most important facet of the game." Match ends, MK Dons 1, Bolton Wanderers 0. Second Half ends, MK Dons 1, Bolton Wanderers 0. Attempt missed. Kyle McFadzean (MK Dons) left footed shot from the centre of the box is high and wide to the left. Assisted by Sam Gallagher following a fast break. Attempt saved. Emile Heskey (Bolton Wanderers) header from the centre of the box is saved in the bottom left corner. Assisted by Lawrie Wilson. Darren Potter (MK Dons) is shown the yellow card for a bad foul. Substitution, Bolton Wanderers. Tom Walker replaces Josh Vela. Stephen Dobbie (Bolton Wanderers) is shown the yellow card for a bad foul. Foul by Stephen Dobbie (Bolton Wanderers). Attempt saved. Emile Heskey (Bolton Wanderers) left footed shot from the left side of the box is saved in the bottom left corner. Attempt saved. Zach Clough (Bolton Wanderers) right footed shot from the right side of the box is saved in the bottom left corner. Offside, Bolton Wanderers. Emile Heskey tries a through ball, but Stephen Dobbie is caught offside. Substitution, MK Dons. Matt Upson replaces Dean Bowditch. Offside, MK Dons. Samir Carruthers tries a through ball, but Sam Gallagher is caught offside. Substitution, Bolton Wanderers. Stephen Dobbie replaces Dean Moxey because of an injury. Offside, Bolton Wanderers. Lawrie Wilson tries a through ball, but Emile Heskey is caught offside. Attempt missed. Dean Lewington (MK Dons) header from a difficult angle on the left is too high. Assisted by Dean Bowditch. Carl Baker (MK Dons) wins a free kick on the right wing. Lawrie Wilson (Bolton Wanderers) is shown the yellow card for a bad foul. Attempt missed. Zach Clough (Bolton Wanderers) left footed shot from the centre of the box is too high. Assisted by Dean Moxey with a cross. Offside, MK Dons. Sam Gallagher tries a through ball, but Jordan Spence is caught offside. Attempt missed. Zach Clough (Bolton Wanderers) right footed shot from outside the box is high and wide to the left from a direct free kick. Attempt missed. Dorian Dervite (Bolton Wanderers) header from the centre of the box misses to the left. Assisted by Gary Madine following a corner.